Bit O’Luck Now Has a Youtube Channel! Check out bios on all of the horses and get to know more about their stories and how they came to be at Bit O’Luck Equine Rescue. 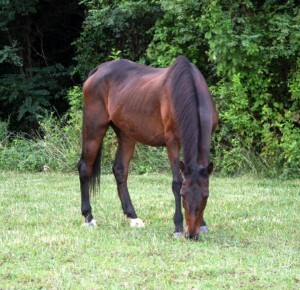 When I met Bit O’Luck (Willie, as he is now known) I had never seen a horse so skinny. Greg and I just went to see if there was something we might be able to do for him. We connected immediately. Willie could steal your heart with his big brown eyes. Even in his emaciated state, he seemed to sense that we were his refuge, even before we knew it. We didn’t think he’d make it much longer, so we decided to make his final days more bearable. Hey, we can feed him, care for him and love him. I had a feeling that if he did make it, I was going to be seeing him a lot more than I had planned. Well, Greg soon had him adopted, moved to a better facility and was mucking and feeding to pay his board. Willie began to blossom under his care. Every day you could see his eyes beginning to clear, he started gaining weight and his attitude got even brighter. He truly loved Greg and Greg him. And so our adventure of rescuing horses began. Our family grew and Bit O’Luck Rescue was born. We love helping these forgotten equines. There’s just something about them. Even if you’re in the worst mood, just being around them can brighten it. They show you a lot about yourself. Good or bad!!! And they love you in spite of it. We now have 10 rescues and 2 boarders, to defray costs. We currently have a few of the horses out on adoption. Occassionally something happens that brings them back to our facility. And, believe it or not, they always seem happy to return. I hope this gives you some insight into the reason for Bit O’Luck to be. We have met some amazing people along the way, made some of them board members for their love of the horses and the expertise in their particular field of knowledge. We can’t do this alone. We need to reach out to every individual that has ever loved a pony, horse, mule, etc.! We hope you follow us here and see where this journey takes us, for better or worse! Bit O' Luck Equine Rescue's mission is to provide an environment through which neglected and/or abused equines are rescued from abusive situations, rehabilitated, retrained and then offered up for adoption to qualified care givers. Bit O'Luck Equine Rescue is a registered 501(c)(3) Non-Profit Corporation. Your generous support enables us to continue the vital program we sponsor for equines in need in the central Carolina's.